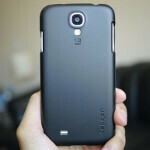 Generally speaking, the bulk of cases for the Samsung Galaxy S4 from accessory maker Spigen have been riding the fine line of being regarded as premium. However, with the Spigen Ultra Fit Case, it’s going in the complete opposite direction, as it’s priced super affordably to fit any budget. Therefore, if you’re looking for something barebones that won’t drain your wallet, this might be something worth checking out. Honestly, when you’re priced so low, we can’t honestly expect to find anything polarizing in the design side of the case. Rightfully so, that’s the obvious case here, as the Spigen Ultra Fit employs a very conventional case design. There are no points awarded to style here, but we do appreciate the urethane material it’s constructed from, because it helps to repel unwanted dirt and debris – while maintaining a very clean appearance at all times. When it comes to protection, it’s lacking the stuff needed to keep our minds safely at ease in the event it’s dropped. Then again, it’s good enough to protect the handset from scratches, but don’t expect it to withstand lengthy drops. Regardless of its less-than-desired protective nature, the case is form-fitting and doesn’t add much bulk to the already streamlined handset. Ultimately, it’s the dirt cheap $9.99 price point of the Spigen Ultra Fit case for the Samsung Galaxy S4 that’s going to attract people to it. The more we think about it, the case is one of those that we wouldn’t mind using if we’re just concerned primarily about scratches that are incurred from having the handset jiggling around with other junk in our pockets. So fit it doesn't protect the top and bottom. Go for the Neo Hybrid. The case is shown to be not snug near the volume button corner in some of the pics. Is this how it fits or was this a mistake?